The first thing I discovered about the Halo 4 spawning model was that the Respawn Zone (RZ) was not the uber influencer like it was in Reach – instead it was the Proximity Enemy Influencer (PE). CertainAffinity told us that this was to ensure that we never spawn near an enemy. But this changing of the influencer weights has fundamentally broke CTF and Dominion, and enabled Spawn Traps in many maps, especially those that use Respawn Zones. When playing CTF, you may find yourself spawning on the wrong side of the map, or even near the enemy flag. 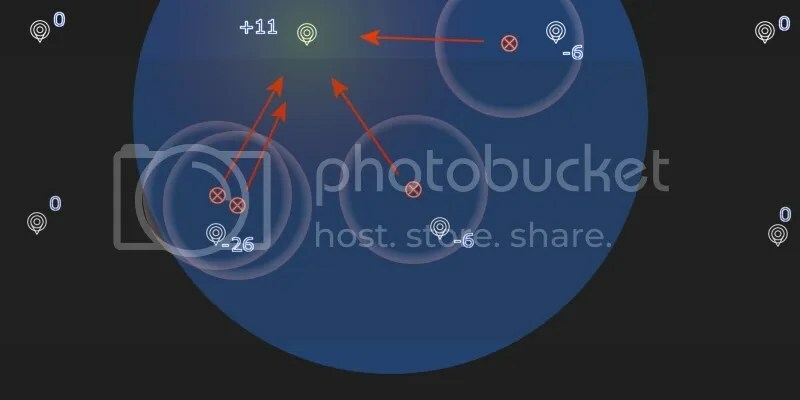 This, of course, breaks CTF at a fundamental level, because you short cut two game elements and retard a third – trek to the enemy base, overcome their defenses, and defend your base. For Dominion, you find yourself spawning across the map near the enemy owned base rather than your own, and also potentially within the base near your teammate. While the Dominion game is new, one cannot argue that this was by design, since the Respawn Zone is obviously intended to anchor the spawning of players in or around their base, and the Anti Respawn Zone is obviously intended to discourage spawning within a base that is not owned by the spawning player’s team. 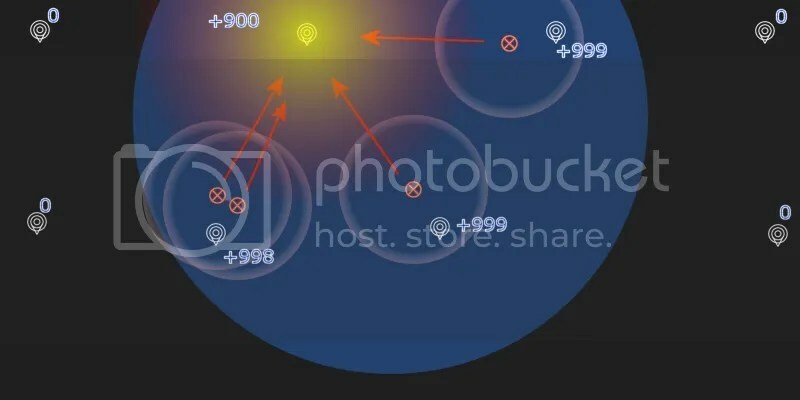 By their location on the map, as few as two or three players can force their opponent to spawn on the wrong side of the map. When this happens, if the spawning player has a teammate near the enemy flag or in an enemy owned base, they can spawn near their teammate – and near the enemy flag or in the enemy owned base. There are actually several features that contribute to cross map spawning. The PE Primary is too strong. This has resulted in pushing spawning players out of their team assigned Respawn Zones. The PE Secondary, weak as it may be, can then push the spawning player far across the map. 343 Industries recognized this problem and created a fix for the Ricochet game type by making the Respawn Zone jump in weight from +14 to roughly +200 when the Rico_Respawn label is attached to it for the Ricochet game. The PE Primary is too wide, making it possible for only two or three on a team to cover their opponents’ Respawn Zones. It would be ideal if 343 Industries patched the code to offer forgers a PE Primary radii override setting within a trait zone. This would allow forgers to adjust the radii for their maps’ sizes, geometries, and game types (e.g., with or without Respawn Zones). The Respawn Zones are too small. Instead of using the Reach model of dividing the maps in half with two team assigned Respawn Zones marked CTF, the zones are in some cases smaller than a single PE Primary. In the picture below, you will see one of the bases on Longbow with three enemies covering the base’s Respawn Zone with their PE Primary zones. 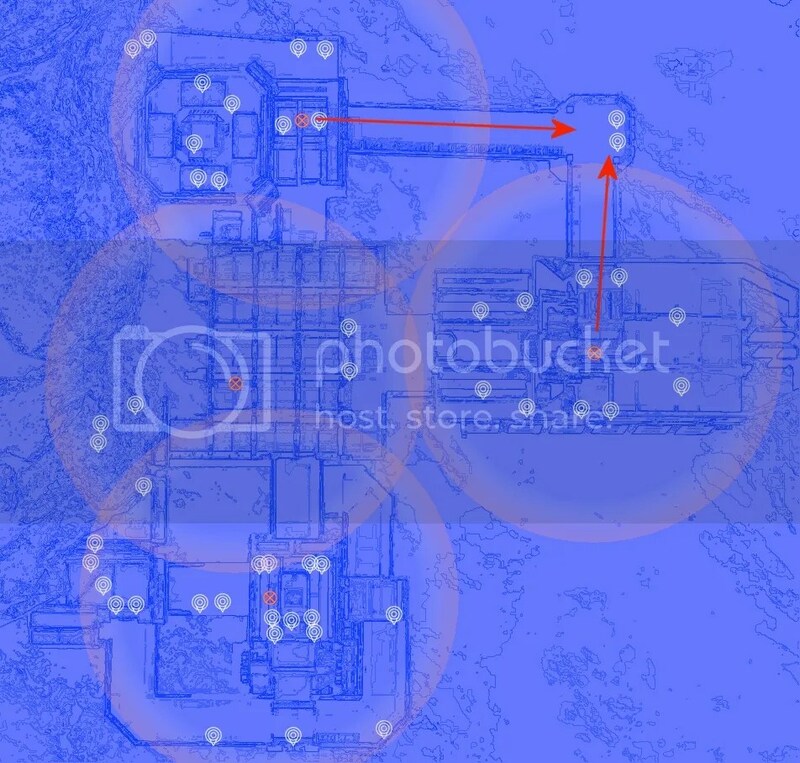 The result is that every Respawn Point in the Respawn Zone is driven down in weight to the point that the team that owns the base is forced to spawn across the map. But while the Respawn Zone can be overcome by PE Primaries to force cross map spawning, it can also be manipulated to make Spawn Traps more readily prosecuted. The rescheduling of the Influencers’ weights is the reason that Spawn Traps are now sustainable in Halo 4. If you take a look at Reach, the order of strength was RZ > Death > PE. You see that a spawn trap was impossible to sustain, because the Death Influencer was so strong that it would cause a player to spawn away from where he died, even if that meant spawning behind the enemy that killed him. In Reach, the Spawn Trap would literally collapse under its own weight. The above picture shows how the Death influencer at the Trap Point lowers the weight significantly more than the Enemy Proximity can, leaving the player to spawn behind one of the enemies. In Halo 4, the order of strength is PE > RZ > Death. This means that not only is the spawning player trapped within the Respawn Zone, but the spawning player cannot escape the Trap Point even if he dies there – the Death Influencer cannot overcome either RZ or PE. In Halo 4, the Spawn Trap remains stable. The above picture shows how the death influencer at the Trap Point lowers the weight, but not nearly enough to break the Spawn Trap. It also shows how the Respawn Zone limits the number of Respawn Points that the red team must cover to force the Trap. The publisher maps for the CTF playlist do not divide the map in half with two Respawn Zones like the Reach maps did. As a result, some Halo 4 Spawn Traps are trivial. In the picture above, the red team captures the blue team’s flag. This leads to the CTF_RES_FLAG_AWAY assigned Respawn Zones on either side of the base to activate. The flag carrier takes a position to suppress one of the two blue team Respawn Zones by himself. The other three red team members create a cross fire Spawn Trap on the remaining blue team Respawn Zone. The red team enjoy a position above the blue team spawns and out of their LOS when they spawn. 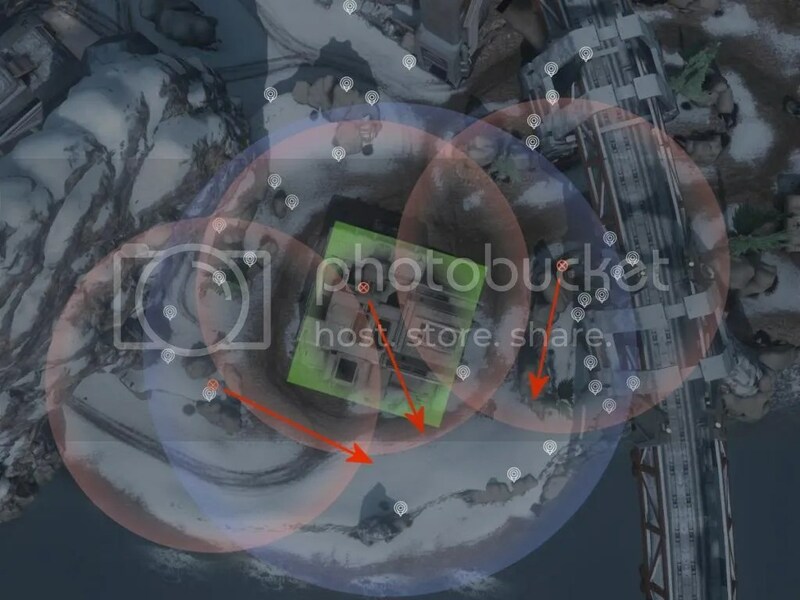 The picture below shows an example of using Respawn Zones in Dominion to create a Spawn Trap. You will see three members of one team create a spawn trap behind a base on Longbow. Assuming that the spawning team has only that base, they are bound to the base’s Respawn Zone and must spawn somewhere in that Respawn Zone. 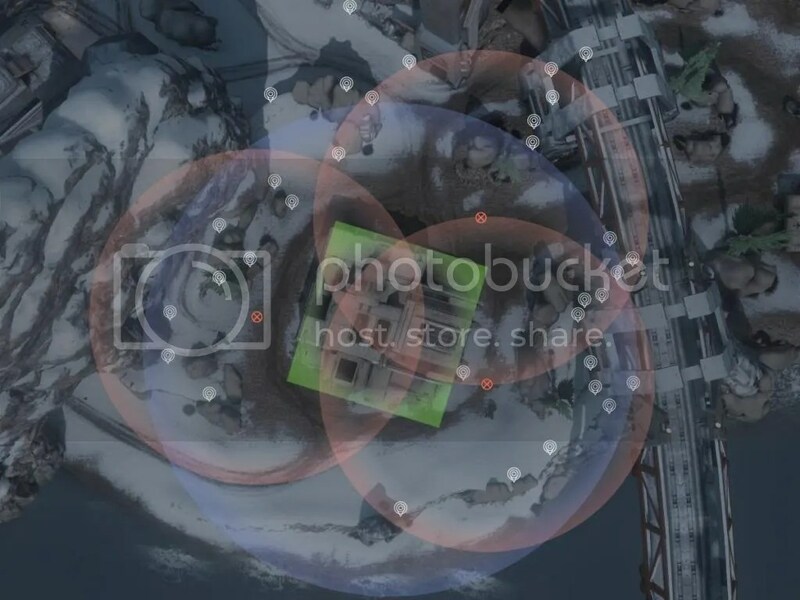 (Respawn Points inside the base are not shown in this picture.) Again, this is because the Respawn Points within the Respawn Zone that are not covered by the enemy’s PE Primary present the highest weighted Respawn Points on the map (well over +5 in this case). One last note about Spawn Traps, should you want to try this at home yourself. 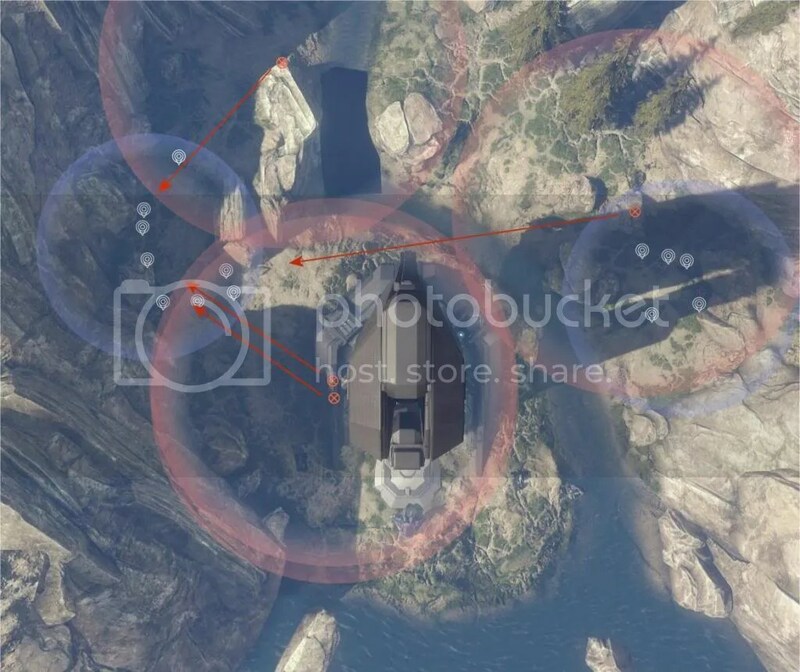 The Line of Sight (LOS) Influencer is the most powerful influencer on the typical map. If you are pointing your weapon at the Trap Point, the spawning player will not spawn at the Trap under any circumstances. The Trap works as long as you look away so that the Trap Points are not in the field of view when you scope to the first scope level (but you can see them along the edge of your field of view when not scoped). Drawing from the above conversation, let’s discuss forging small maps on the forge canvases. Consider Shutout (presented by permission), a 4v4 map that put into the matchmaking playlist. The PE Primaries of one team appear to be capable of covering nearly every Respawn Point on the map. By carefully positioning each player, the two Respawn Points on the bridge elbow are purposely left uncovered, thus forming a Spawn Trap. This map is familiar to forgers because it is a common community map within the playlist and also a popular remake. For these reasons I felt it was the best vehicle to demonstrate the severity of the problem at hand. In essence, the PE Primary radii are freaking way out of proportion for normal maps, and even worse for small maps. Compare the PE Primaries’ radii of 9.5U in the picture above to Adrift’s PE Primary radius of 5.5U, or Haven’s 7.0U radius, and you begin to realize that the forge canvases were intentionally configured by 343 Industries for forging large maps, not small maps. The schedule of weights has fundamentally broken CTF and Dominion by enabling cross map spawning. The schedule of weight has enabled the sustaining of Spawn Traps, especially when Respawn Zones are used. Just like Respawn Zones make Spawn Traps easier by reducing the area an enemy needs to cover with their PE Primaries, small maps also make Spawn Traps easy for the same reason. For a list of the influencer weights, see Spawning: Discovering The Weights. The PE Primary is 9.5U in radius for each of the four forge canvases: Impact, Ravine, Erosion, and Forge Island.